When you consider their respective backgrounds, it’s little wonder why Dow AgroSciences and new President/CEO Tim Hassinger ended up together. Both share a lifelong passion for all things agricultural. From the company’s perspective, this agricultural focus is evident in the main lobby of the headquarters building, located in Indianapolis, IN. Just beyond the reception desk, visitors will find mounted plaques detailing Dow AgroSciences’ 26-year history. These contain information (and a few examples) of key company products and agricultural developments. There’s also a wall just beyond these honoring key agricultural patents held by the company (and pictures of the researchers that pioneered them). These and other agricultural innovations have helped Dow AgroSciences to achieve sales of more than $7 billion by the close of 2014. Also on these signposts are photographs of the people who have led Dow AgroSciences throughout its history. This now includes Hassinger, who assumed the head spot on May 1, 2014. While his personal background cannot be found on these lobby plaques, Hassinger isn’t shy about sharing the path he took to the top job at one of the world’s leading crop protection/seed companies. So when he graduated from high school, Hassinger enrolled at the University of Illinois and started working towards a degree in agricultural economics. “I went to school with the intent of becoming a farm manager someplace,” he says. Upon graduation, Hassinger joined Dow as a sales representative for its territory in Northern Illinois. Then, when Dow AgroSciences was first formed in 1989 as the DowElanco joint venture, he transitioned to that company, working in supply chain management, marketing/research and district sales manager roles. From there, Hassinger tried his hand at the growing global segment of Dow AgroSciences’ business. In 2001, he was named global business leader in the insecticides Global Business Unit. He then moved to China for a few years before returning the U.S. to take responsibility for the company’s Latin America, Europe and Pacific Regions businesses. Finally, when former President/CEO Antonio Galindez announced his retirement in March 2014, Hassinger was named as his successor. 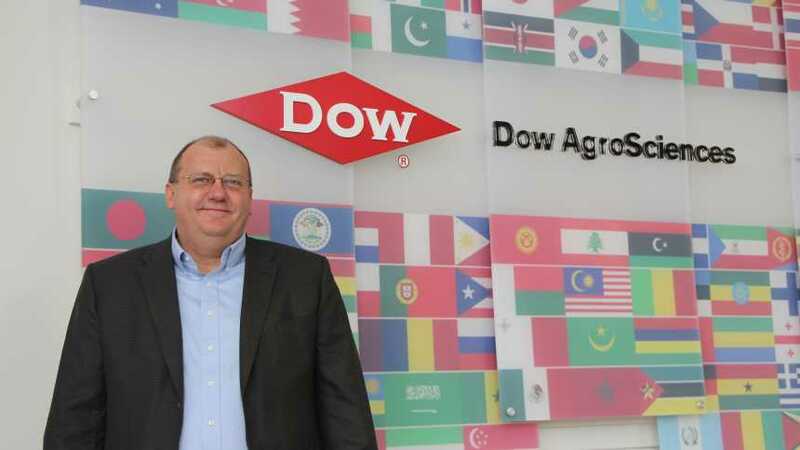 Given that both company and man have been so focused on agriculture throughout their respective timelines, it should come as no surprise what single word Hassinger says best describes his vision for Dow AgroSciences in 2015. According to Hassinger, an example of this new technology is the Enlist Weed Control System. “This is a technology we at Dow AgroSciences are very excited about,” he says. Combining both of the company’s key markets for seed and crop protection products, the Enlist system includes Enlist Duo herbicide, which is a blend of new 2,4-D choline and glyphosate featuring Colex-D Technology, and Enlist-tolerant crops such as soybeans, corn and cotton. At the present time, the EPA has approved the use of Enlist Duo with Enlist corn and soybeans, with cotton still pending. The company has also obtained federal registration in 15 key corn and soybean producing states such as Illinois, Indiana, Ohio, Iowa, Missouri and Nebraska. Despite these approvals, however, Dow AgroSciences is taking what it calls a stewarded approach to the Enlist system’s introduction to the marketplace. “We believe this is necessary because we are still working on gaining the needed import approvals for Enlist crops from countries such as China,” says Hassinger. So for 2015, Dow AgroSciences will be extra cautious. According to Damon Palmer, director of marketing, U.S. Seeds, the company is insisting that growers who plant Enlist corn only use it for animal feed on their own farms. Also, growers should make certain there is at least a 660-foot isolation zone between Enlist hybrids and other crops. “And Dow AgroSciences will make in-season visits to these farms to make sure that these protocols are being followed,” says Palmer. However, once the company obtains more widespread approvals for the Enlist system — both in the Americas and for overseas markets — Palmer anticipates these initial restrictions will be altered accordingly. “This will probably start changing in future seasons,” he says.